Motivational finance books, such as The One Minute Millionaire or Think and Grow Rich stress the importance of giving. They claim that if you give, you get back a thousandfold more. How is that? Doesn’t it seem counter-intuitive to you? It always has to me. But, it isn’t and here are my thoughts as to why. Humans are hard-wired to give. We are social animals. We have evolved over the eons to live in groups for protection. Admittance to the group used to insure an individual of shelter, food and protection against other groups and animals. Admittance to the group also DEMANDS that the individual contribute to the group. The individual has to give something to get the benefits of the group. Because we evolved this way, giving makes us feel good. When we feel good, we are less stressed, happier, calmer and so healthier. The New York Times article from 2009 called In Month of Giving, a Healthy Reward backs this up with citations of multiple studies showing various health benefits of giving. Giving builds your social contacts. It’s commonly written that the more people you connect with, the better chance you have of becoming better adjusted, healthier, more successful and richer. Giving (especially of your time) helps you connect with people in a common cause. Growing acquaintances into friends and possibly business associates helps you become successful, happy and may just give you that million dollar business idea. We all know our economy can use some help. When you contribute to your favorite cause, you not only help the cause, but you provide funding for that cause to hire employees, buy materials and purchase services – all of which put money into circulation to help grow the economy. If the economy is doing well, chances are you are better off. Giving is congruent with most religions. Many people believe that humans have an immortal soul that needs to be nourished so we can spend the ever-after in an agreeable place. Giving is acknowledged as an acceptable way to move towards those pearly gates. Giving causes a natural ‘high’. So go ahead, be selfish and GIVE! What’s your favorite way? I agree, helping others is one of the easiest cures to depression out there… thanks for the excellent reminders! I’ve heard that as well. Happy giving! Nothing beats the feeling of seeing a smile on someone’s face after you gave something to them. Marie!! Well done here! Giving is selfish and we ought to accept that and get on with it. My fave is simple kindness on a very consistent basis. Smiles, kind words, holding a door, cheer leading for someone who is trying. These are my every day gifts to others. One of my most memorable college moments was when someone extended the simple kindness of a cup of tea to me when I was sick with a cold. 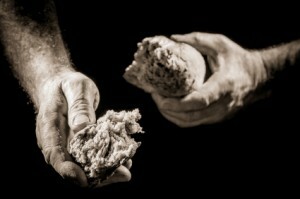 We don’t tithe (not religious) but we give way more than what is “required” if we were tithing. I totally agree with you on feeling good when giving. It feels awesome esp. when you hear back from someone you helped. Volunteering is the same way. As an added bonus you can learn a lot if you are doing something new with volunteering. I think we always learn more with active helping than with just giving money. I love it. I should say I love it. It is so easy not give, but it is something that people always have to be reminded of how good it is to do it. I think part of us know that, but we foget. Thanks. I watched m oldest sister give her divorce settlement to the church (“god will provide”) and over that period they sucked the life out of her. She now lives in a 1 br apt, living on SS with no real means. I think there ought to be a law on how much a church or any org can take. Sad really. That is sad. Although it is beneficial to give, part of that is first being able to care for your self and those for whom you are responsible (charity begins at home as the old saying goes). I admire what your sister did, but she should’ve not given everything to the church. She should have left for herself. I think there are more folks who give all than we realize. If you think about some of the cults, you can see their influence on folks giving everything they own away. We make donations to education (large check sent annually to our alma matter as well as lots of donations to our kid’s school) and to the local food bank (monthly stipend). These don’t necessarily make us feel better, but they are important to us. My wife and son also volunteer several times a month at local charities (Family Giving Tree is one) helping to sort donations, clean up, or do any other work that is needed. They get a lot more out of physically volunteering than just donating money. Physically helping would be more meaningful to a child. Excellent post, Marie. It really is true that you get back more than you give – even if your giving isn’t very public. I am so much happier after I help others that i can’t help but be more successful in my own endeavors. That’s probably true of most people. I’m glad you are having success with your endeavors! When I was a little girl we always learned in church that we should give completely selflessly, but that we would be blessed so abundantly for doing so! Still trying to sort out that Catch-22, but the benefits of giving are SO huge! Great article. I like to give time and be part of a project. Now I also put up a couple of scholarships for kids in my village to pursue further education. It is nice to be able to give back. Wow, that is super! Are you able to follow the kids as they make use of the scholarships, graduate and move up in the world?